A New Map of the Islands of the Aegaean Sea, Together with The Island of Crete And the Adjoining Isles. 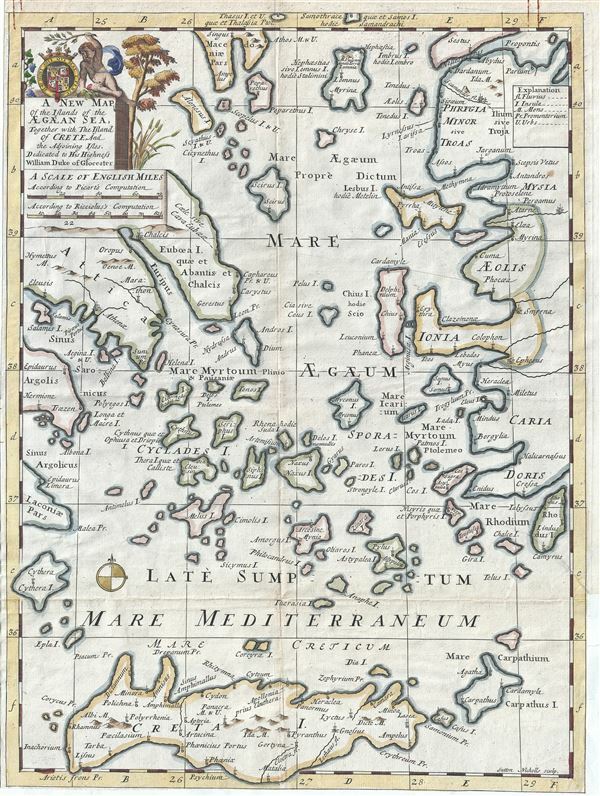 This is a beautiful 1712 map of the Islands of the Aegean Sea by Edward Wells of Oxford. The map covers the Greek Isles or the Islands of the Aegean Sea from Myrina south to include Crete and from Cythera east as far as Rhodes. Includes the island of Euboea, originally believed to be a part of the mainland until it was separated by an earthquake and is the second largest island in Greece after Crete. The Cyclades, the Sporades, the Ionian Islands and several other Greek Islands are noted. Important cities, rivers and mountains are noted. Very good. Original platemark visible. Minor wear along original fold lines. Narrow margins. Top margin shows rusted paperclip stains.